See Sicily with a great Sicily tour! • Small group size, usually fewer than 16. • Convenient itineraries with just 2 or 3 hotel check-ins. • Tours almost every week. • Good prices because there's no re-seller between you and us. • Personalized services like airport pick-up or extra nights before/after your tour, because our staff of Sicily travel specialists is based in Sicily. • Visit us right now for details, FAQs and reservations. We also do custom tours, for groups of any size. Shouldn't your tailor-made vacation be arranged by your own travel expert in Sicily? Sicily Concierge will plan your trip from arrival to departure, whether it's a one-day excursion or a one-week itinerary. You can expect real travel services from real travel agents. Start dreaming, and visit Sicily Concierge. Castles in the clouds are just the beginning. Considered Sicily's "Baroque City," Noto is in the province of Syracuse, in the southeastern corner of Sicily. The town is located about 35 kilometers southwest of the city of Syracuse. Old Noto was completely destroyed in the extremely violent earthquake that struck Eastern Sicily in 1693, a quake that heavily damaged Catania and Syracuse also. The present site of Noto was rebuilt from scratch, and almost entirely in the Baroque style, the prevailing style of building in Sicily at the time. The area around Noto towards the west was populated by a Bronze Age people between 2000-1500 BC (BCE). The noted archaeologist who explored and studied the site, Paolo Orsi, ascribed the name "Casteluccio Culture" to the site and its inhabitants. The major part of the significant finds unearthed here are now on display in Syracuse's Archaeological Museum. The site of the excavations can be visited daily from 9 to 1 in the mornings. There are a few ruins of the prehistoric village and a primitive necropolis. 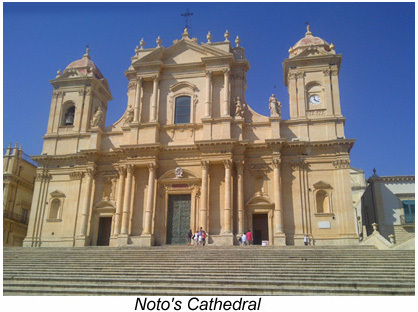 The history of Noto prior to the 1693 quake belongs to the old town, now called "Noto Antica" and known in antiquity as "Netium." What remains of the old town is located some 13 kilometers from the present town of Noto. A plausible legend has it that Noto Antica was founded by a leader of the Sikels called Ducetius circa 500 BC. Scholars have dated the earliest ruins to circa 800 BC. With the Greek colonization of Syracuse, Netium came into contact with the advanced Hellenistic Culture and was eventually absorbed by it. Noto Antica achieved a certain level of importance during the Arab period when it became the administrative center of the Noto Valley, one of the three provinces (briefly an emirate) that the Arab governors subdivided Sicily into. The town was one of the last bulwarks of Saracen resistance to the Norman takeover, not surrendering to Count Roger de Hauteville until 1091. The history of Noto generally follows the general flow of Sicilian history. At its eastern end is the town's gate, known as Porta Reale, built in 1838. Noto's grand main street, Corso Vittorio Emanuele, offers a good view of the city's architecture. The neo-classical church and convent of the Holy Savior dates from 1703, the Church of San Francesco from 1745, the latter at the top of a splendid wide stairway whose steps curve all the way up to the entrance. The "Museo Civico," or Civic Museum, is situated on the first floor of the Holy Savior convent, at 134 Corso Vittorio Emanuele. This museum is being restored. It contains pre-historic objects, ancient Greek pottery and statuettes from a Greek sanctuary dedicated to the deities Kore and Demeter. The next plaza you will come to is Noto's main square, the Piazza Municipio, where you'll find the Cathedral of Noto. Unfortunately, the cathedral's dome (cupola) collapsed due to an earthquake a few years ago and has yet to be rebuilt. The Palazzo Vescovile (Bishop's Palace) is next to the cathedral while the town hall is opposite, across the square. Noted for its elegant portico, the Town Hall, known as Palazzo Ducezio, was built in the Neo-Classical style in 1746 to plans by Vincenzo Sinatra. Palazzo Alfano flanks the left side of the Cathedral, and next to it is the Palazzo Villadorta. The latter was built for a Sicilian aristocrat in a fanciful Baroque style back in the 18th century. Palazzo Villadorta is decorated with superb wrought-iron balconies and a series of fantastic statuettes of nymphs, lions, ogres and other mythical animals; the effect is similar to that of Villa Palagonia in Bagheria. Towards the end of the Corso, you will come to Noto's last large piazza, the Piazza XVI Maggio. Here you will find the Church of San Domenico, with its elegant curving facade built in 1727 by the architect Gagliardi. The Villetta di Ercole is a little villa which has a fountain with a statue of Hercules. It is said that this statue is a Greek work recovered from the ruins of Noto Antico, but some scholars disagree. The Vittorio Emmanuele Theater is also located here and dates from 1842.